The Bulls have confirmed that Springboks centre Wynand Olivier will miss their Currie Cup campaign to take up a contract with the Ricoh Black Rams. Olivier, who has 37 caps for the Boks, will depart Pretoria at the end of the current Super Rugby season and will return from Japan in February 2013 in time for that year's Super Rugby tournament. With 100 games for the Bulls to his name, the franchise have opted to allow the centre to sit out the Currie Cup because of his previous commitment to the South African side. "We believe this is a win-win situation for Wynand, the Bulls and the Rams," Bulls CEO Barend van Graan said. 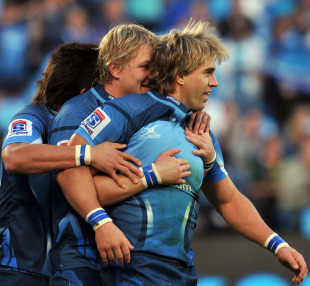 "Wynand has been a very loyal servant to the Bulls and Blue Bulls and has played in all our teams since school. "We were happy to accommodate his request for a release as we appreciate his commitment to the Bulls over many years of service."